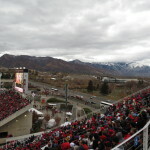 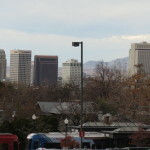 Rice–Eccles Stadium is located east of downtown. 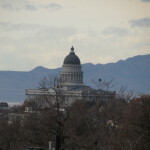 The skyline and capitol are beautifully visible from campus grounds. 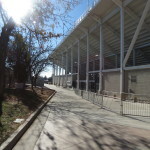 The buzz around the stadium starts early as band members parade through tailgating lots, run circles around traffic cops, and turn random boulevards into concert venues. 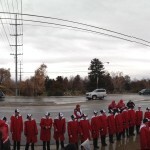 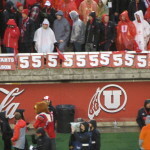 It all leads up to the Ute Walk. 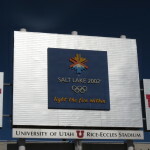 Fans gather along the sidewalk leading to the grand entrance where the 2002 Winter Olympic Cauldron stands proudly. 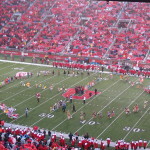 Players and coaches are greeted by adoring fans vocalizing their support and waving all sorts of red paraphernalia. 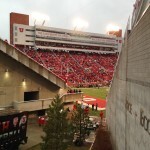 Kickoff is looming and entering Rice–Eccles Stadium is worth the wait. 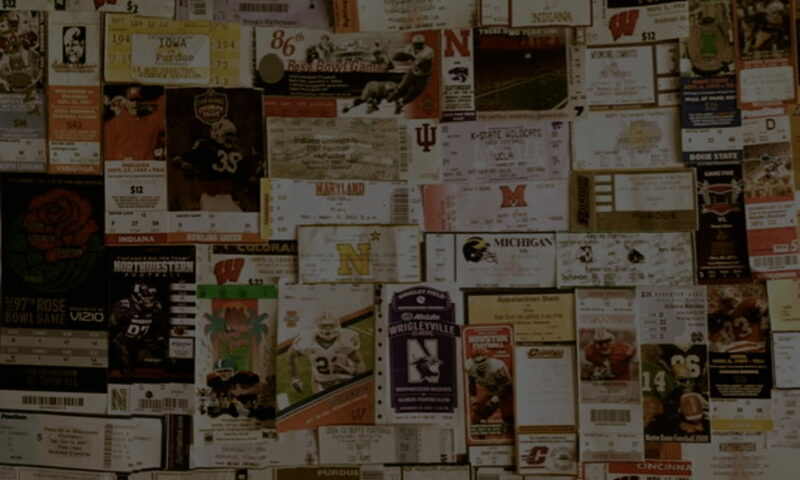 Every seat offers stunning mountain views that will challenge the memory storage on your camera. 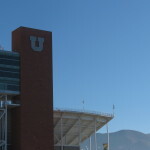 In the distance, an oversized block U marks a high peak looking down over the stadium. 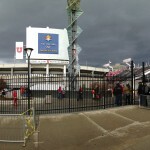 Utah victories result in the lighting up of the campus icon. 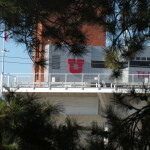 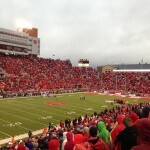 The pride is mutual between the university and Utes, the honored tribe after which the state is named. 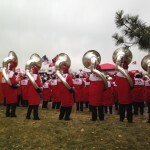 Game day traditions reflect Ute heritage right down to the logo that is adorned with ceremonial feathers. 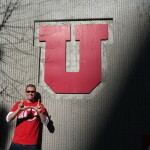 There is, as one might imagine, pockets of discord that arise when using sacred symbols of a group’s heritage. 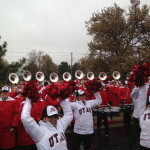 Yet, halftime of the game CFT attended included a ceremonial dance from members of this Great Basin Indian tribe, who vocalized their support of the Ute nation being the symbol of the University of Utah. 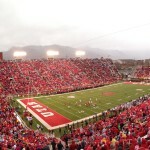 Adding further to the game day atmosphere in Salt Lake is the Mighty Utah Student Section (MUSS). 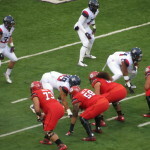 This gaggle of wildness prides themselves in successfully distracting the opponent with the boisterous third down jump and a tally of how many false starts they cause for the visitors. 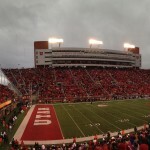 The crowd feeds off the MUSS – the noise, the chants, the stadium flags – their advanced level of choreography is rare to see in most stadiums. 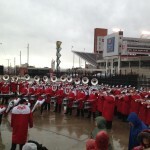 They certainly rank as one of the top most involved sections in the nation. 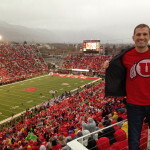 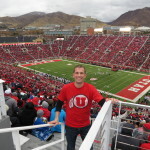 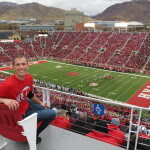 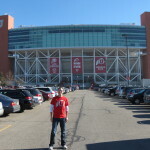 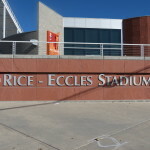 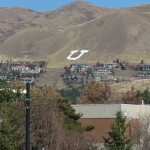 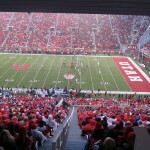 The city, the scenery, and the fan base make this a true home field advantage, and a must see for sports fans – get to Rice–Eccles and throw up a U!